There’s so much he forgets these days. On a flight recently to the Los Angeles medical center where they studied his brain, he grew confused about his destination, about the reason for the trip. His memory, his emotions: They’re jumbles, pieces of a puzzle in disarray. The doctors at the center confirmed why. Dorsett, 59, has chronic traumatic encephalopathy, or C.T.E., a degenerative brain disease that has now been found in dozens of former pro football players. 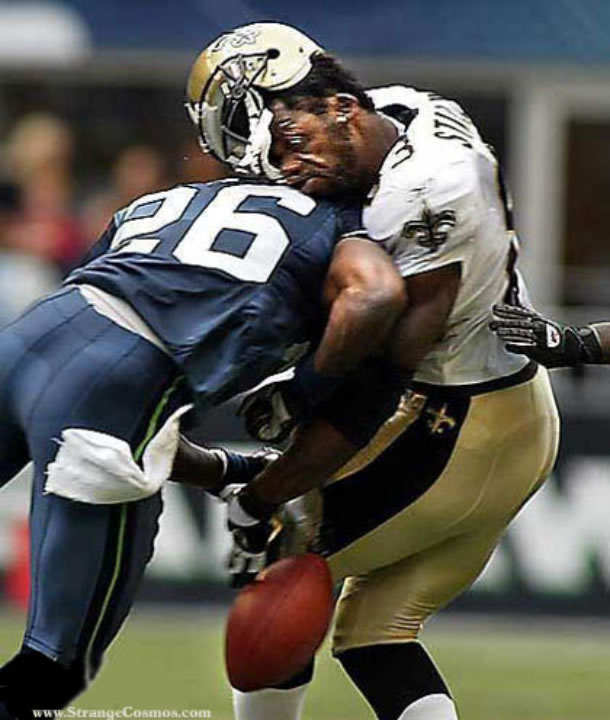 It’s most likely caused by big hits like the one in 1984 and little hits that happen on every play, a constant thwack-thwack-thwack of a player’s head against his helmet. This is the reliable, unremarkable percussion of the sport. This is its very rhythm. “Would I do it all over again?” Dorsett said to Blitzer, beating his questioner to the punch. “Yes.” The damage, in other words, is worth the thrills, and not just to Dorsett, who can’t alter the terms of the trade-off at this befogged point. Team owners and coaches have made the same calculation. So have the money-mad executives in the National Football League, and so, too, have we fans. All of us have entered into a compact, a conspiracy. For the pleasure the sport gives us, we’ll tuck away our reservations about its culture of violence. We’ll turn a blind eye to the wreckage. That wreckage isn’t just physical, as news last week about the vicious, racist hazing of a young Miami Dolphins lineman showed. The lineman was so shaken that he fled the team. And when his departure came to light, what did other Dolphins and players around the N.F.L. have to say about it? Nothing terribly empathetic. Most of the comments I saw questioned his machismo and defended the taunts and threats as jocks being jocks — or, even worse, as a sanctioned strategy to toughen up a wimpy newbie. “The coaches know who’s getting picked on and in many cases call for that player to be singled out,” wrote Lydon Murtha, a former Dolphin, in a post on the Sports Illustrated website. “This is a game of high testosterone, with men hammering their bodies on a daily basis. You are taught to be an aggressive person.” Aggression is central to the brutal ballet that we fans have grown accustomed to. It’s also the path to victory, and thus the road to riches. It’s recruited. Rewarded. To have our football and our fun, we delete what we learned about the New Orleans Saints: that the squad had put bounties on rivals, promising thousands in cash to any defensive player who knocked an opposing team’s quarterback out of the game. We look past how many quarterbacks — and cornerbacks and linebackers and wide receivers — wind up prostrate on the gridiron, a circle of trainers and doctors hovering over them, one of the sport’s most familiar tableaus. In last Monday night’s contest between the Green Bay Packers and the Chicago Bears, the Packers’ star quarterback, Aaron Rodgers, fractured his collarbone; he’ll be out for several weeks, just as the Bears’ star quarterback, Jay Cutler, has been. In this era of bigger bodies, blunter force and rampant casualties, championships don’t necessarily go to the best teams, but to the ones with the most men standing. We brush that aside, as we do the substance abuse and each bulletin about the latest arrest. Aaron Hernandez isn’t playing tight end for the New England Patriots this year because he’s on trial for murder. If it’s not one alleged felony, it’s another, the on-field aggression traveling off-field to dogfights, fistfights, sexual assault: the high jinks of American idols in their idle time. We minimize the relentlessness with which the sport is pursued and its message that nothing — nothing — matters more than winning. Is it coincidence that two head coaches were hospitalized this month, or is it the wages of a workaholic ethos? John Fox, of the Denver Broncos, had emergency heart surgery. Gary Kubiak, of the Houston Texans, had what’s sometimes called “a warning stroke.” The commentators wished them well and the game went on. It always does. We minimize the tyranny of money, money, money. Money is surely why Dan Snyder, the owner of the Washington Redskins, won’t change the team’s name: What if too many fans were irked and too many of their dollars withheld? Money is certainly why there’s now a prime-time game every Thursday night, though the teams playing it get just four days of recovery from their Sunday matches, an abbreviation of down time that’s a potential force multiplier of injuries. Roger Goodell, the league’s commissioner, won’t be thrown off his financial goal, sketched out in a chilling profile of him by Don Van Natta Jr. in ESPN’s magazine last March. Within 15 years, Goodell wants to boost annual revenues to $25 billion from $10 billion. THAT would be jeopardized if the N.F.L. took responsibility for the prevalence of brain disease like Dorsett’s and like that of several former players, including the San Diego Chargers linebacker Junior Seau, whose suffering drove them to suicide. (The recent $765 million settlement of a lawsuit by more than 4,500 players and their families was paltry in the context of all the lives ruined.) The league’s sustained refusal to confront this situation seriously and honestly is documented in “League of Denial,” a book by Mark Fainaru-Wada and Steve Fainaru that was published last month. I did feel sorry for these men, but if they say they would do it all over again – no regrets – if they had the chance, then I cannot say that I should spend any longer thinking about the dismal situation. If someone made me lose my memory and gave me brain damage and I was asked – would I do it all again – I would exclaim a profound – absolutely not! If they would do it all over again, then any amount of reform would not matter, because no matter the risk, they will play football anyhow. The man who said the game is all about money needs to understand that if the world is about capitalism, everything is about money. If he wants to change how football is played, it being about money, he needs to address the economic system that drives the game. Capitalism darn mean we shouldn’t care? In fact caring for the weak in society is at the heart of capitalism itself. Kanaga, I will have to disagree. I believe capitalism is incompatible with caring. For how can you make millions and billions — if you cared, wouldn’t every time you saw a homeless man on the street, you buy him a house or at least food to eat? With that kind of behavior, millionaires would soon be poor men. If the football owners cared about health of their players more than the masters cared about the health of their slaves, they would soon be subject to equal treatment and there would be no inhumanity in football, in fact, the game as we know it would cease to exist. There has to be some distance between the capitalists and caring otherwise I believe the system would fall apart.